Point Pleasant junior Logan Southall locks in a hold on an opponent during a match at the 2018 Jason Eades Memorial Duals held Dec. 8, 2018, at Point Pleasant High School in Point Pleasant, W.Va.
HUNTINGTON, W.Va. — A thoroughly consistent weekend. 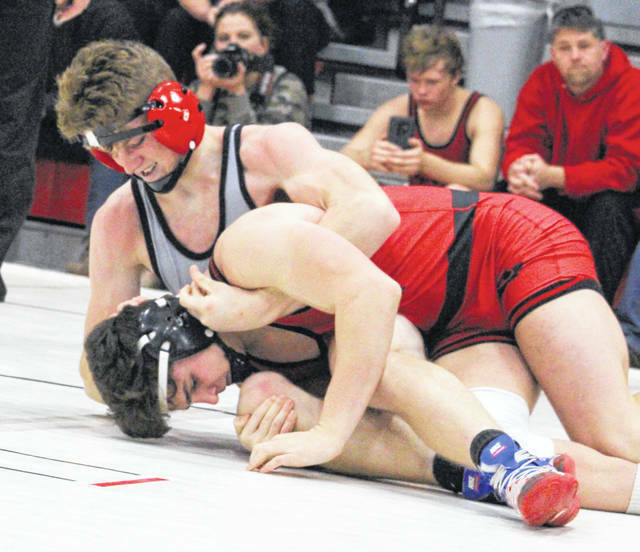 The Point Pleasant wrestling program came away with 11 placers and a pair of individual champions while rolling to a 17½-point victory over a 69-team field Friday and Saturday at the 2019 WSAZ Invitational held at Big Sandy Superstore Arena in Cabell County. The Big Blacks varsity lineup posted a winning tally of 230.5 points, which included nine top-six finishes and a trio of weight class finalists. The Point Pleasant ‘B’ squad also ended up 19th overall with 42.5 points and had both a runner-up and a third place performance at the event. Saint Joseph Academy (PA) was the overall runner-up with 213 points to go along with a tournament-best five weight class champions. Huntington was third with 194.5 points and Johnson Central (KY) was fourth overall with 176.5 points. River Valley (73.5), Gallia Academy (68) and Wahama (33.5) also took part in the two-day tournament, but the local squads earned respective finishes of 25th, 26th and 37th overall. The Raiders had a trio of a placers, while the White Falcons also had one grappler score a top-eight effort. Point Pleasant’s primary team received a individual crowns from Isaac Short at 106 pounds and Derek Raike at 120 pounds. Both champions posted identical 5-0 records with three pinfalls in their respective divisions. Mitchell Freeman was the 138-pound runner-up after going 5-1 overall with four pinfalls, while Christopher Smith was third at 113 pounds with a 4-1 mark that included a pinfall win and a technical fall. Logan Southall also placed third at 160 pounds with a 6-1 record, including two pinfalls and a technical fall. George Smith (132), Wyatt Wilson (145) and Jacob Muncy (285) all finished fifth in their respective weight classes. Both Smith and Muncy went 6-2 overall with a pinfall apiece, while Wilson was 5-2 with a pinfall victory. Zac Samson was also sixth for the Big Blacks after going 4-3 overall with two pinfalls at 152 pounds. Point’s ‘B’ team managed second and third place finishes at 106 pounds as Parker Henderson and Mackandle Freeman both went 4-1 on the weekend. Short, Henderson and Freeman also allowed PPHS to finish one, two and three in the lightest division of weight classes. Jacob Edwards came away with the Raiders’ top effort of the weekend after placing fourth at 126 pounds. Edwards went went 6-2 overall and landed two pinfalls to go along with a technical fall. Will Hash (145) and Eric Weber (182) both finished sixth for RVHS in their respective weight classes. Hash was 6-2 with two pinfalls, while Weber went 6-3 with four pinfall wins. Antonio Serevicz was the lone White Falcon to place over the weekend after finishing fifth at 220 pounds. Serevicz went 6-2 overall with two pinfall victories. The Blue Devils did not have a single grappler finish the weekend on the podium, but senior Lane Pullins did notch his 100th career victory with a pinfall win (3:09) over Jacob Davis of Musselman at 182 pounds. Pullins finished the weekend 4-2 overall with three pinfalls. With half of the 14 divisional titles acquired by St. Joseph Academy and PPHS, only Saint Albans joined that duo with multiple crowns after winning two. East Fairmont, Cabell Midland, Huntington, Greenbrier West and Johnson Central also came away with a weight class champion apiece. Visit wvmat.com for complete results of the 2019 WSAZ Invitational held at Big Sandy Superstore Arena.